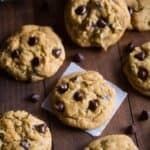 I’ve known I wanted to share a great chewy pumpkin cookie recipe for a while now. I’d imagine the best chocolate chip cookie of my life, and add the wonderful flavors of pumpkin and fall spices to it. Can you get more heavenly? Unlike so many pumpkin cookie recipes that are soft and cakey (and don’t get me wrong, I LOVE that kind as well! 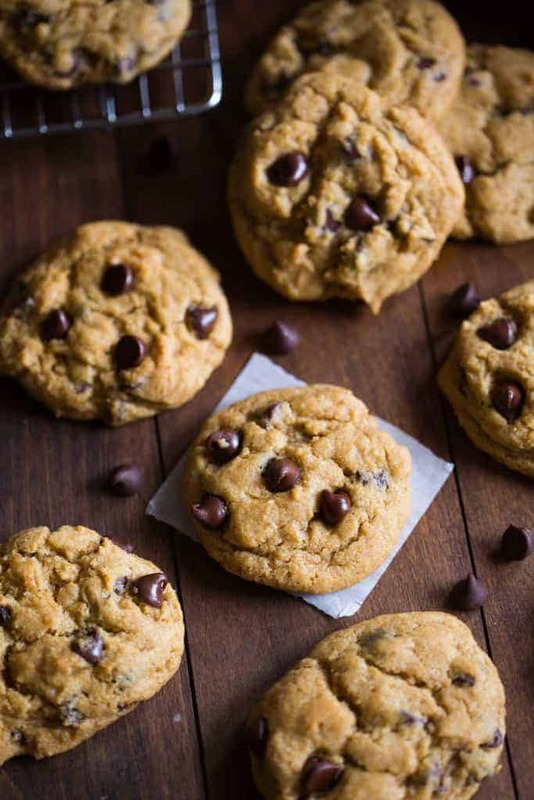 ), this recipe makes unbelievable, crisp on the outside and soft on the inside, chewy pumpkin chocolate chip cookies. There is definitely a place for both types of cookies, am I right? I don’t ever discriminate when it comes to pumpkin cookies. Love them all. These cakey pumpkin cookies with caramel frosting are pretty much the greatest dessert to enter my mouth. I think it just depends on your mood. Lately I’ve been craving chocolate chip cookies. Like this chocolate chip skillet cookie that I posted recently. Absolutely amazing. My husband, however, has been beggggggging for pumpkin cookies. So this recipe was a beautiful mash-up of two of our favorites and OH boy, did this make us both delightfully happy. 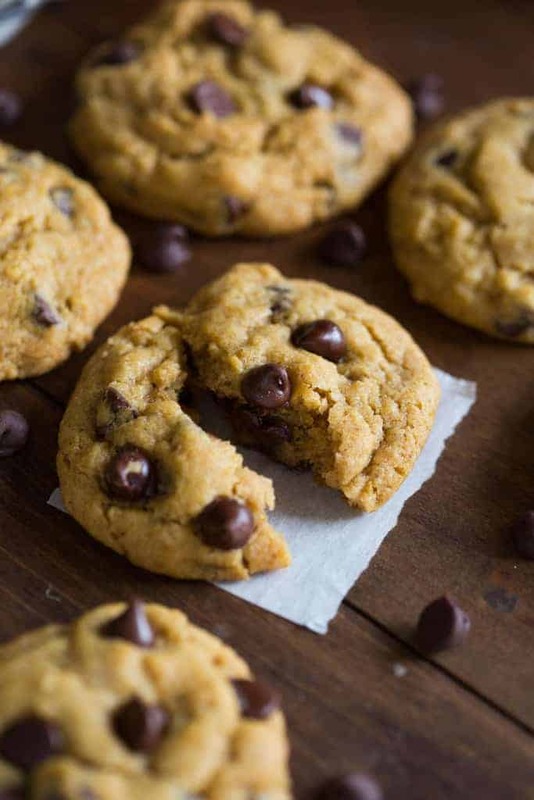 I love you, chewy pumpkin chocolate chip cookies! Best mash-up ever. 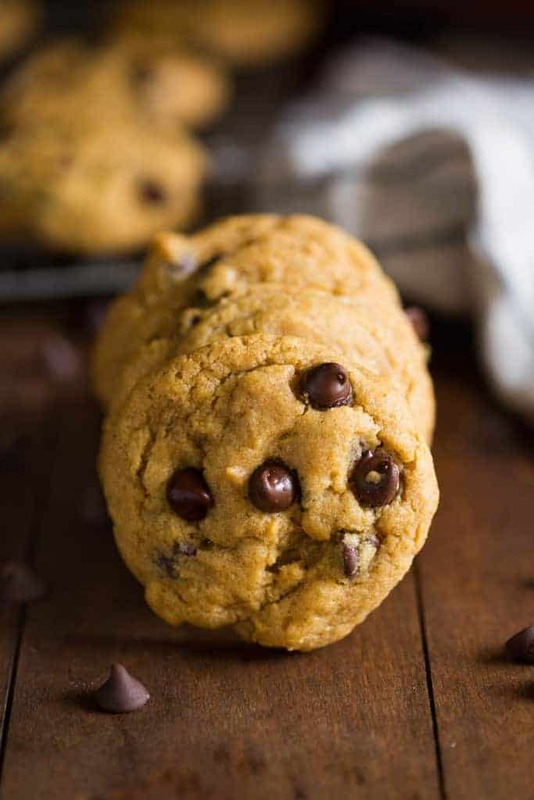 Perfect, bakery style, chewy pumpkin chocolate chip cookies. Use an electric mixer (or stand mixer) to combine the butter, brown sugar and granulated sugar until well combined. Mix in the vanilla and pumpkin. Add the flour, salt, soda, cinnamon ginger, nutmeg and cloves and mix just until combined. Stir in chocolate chips. Bake cookies for 13-17 minutes or until they are just slightly golden around the edges. Transfer them to a cooling rack to cool completely. These look. Delicious!!! I cannot wait to try them. Yep! I scoop two small balls and place them on top of each other so that when they bake, the bottom half will cook first, and then the top half, resulting in cookies that are soft and chewy on the inside, but slightly crisp on the outside. I’d love to hear how you like them! My husband and daughter liked these a lot. They fell over though and were oddly shaped. I’m making them again today using fall m&ms. I plan to refrigerate the dough longer before I bake. Maybe that will help keep them upright.